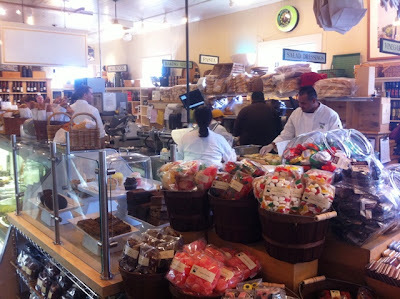 The Ms. Lin Guide: Oakville Grocery (Napa Valley) - with Recipe! Two separate groups of friends were visiting from out of town, and Napa Valley was definitely on their itinerary. I ended up going to Napa Valley twice in one weekend (a record for me lol) but had two extremely fun but completely different experiences. 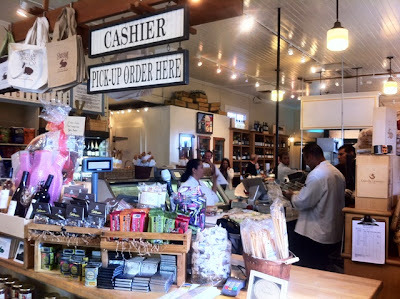 I am going to spend the next few posts on some of the places we visited since it seems that I haven't written about any places in Napa at all. On my first trip, we started early in the day and had a full day of wine-tastings booked so we didn't really have time to stop for lunch. We just stopped at Oakville Grocery for some quick bites and we were on our way. Oakville Grocery is a cute little market on the way to many of the popular wineries in Napa Valley. It carries a number of gourmet items and it's a great stop to pick up sandwiches, cheeses, etc. if you want to do a picnic. Even though we know their sandwiches are great, we opted for some salads since we wanted something lighter. I got the chicken salad and it was delicious. The chicken was moist and the sauce was pretty light. It was surprisingly filling and I'm glad I loaded up on protein because we had many wine-tastings ahead of us! Marinate chicken for up to one hour before cooking. Skewer each piece lengthwise on bamboo skewers. Roll marinated chicken in dry ingredients and let stand for 1/2 hour in the refrigerator. Bake on oiled cookie sheets, turning chicken to coat in oil at 425 degrees for 12-15 minutes. Pulse Dipping Sauce ingredients in a food processor until smooth. Serve at room temperature. Great pictures and a great write up! Can't wait to try the recipe.